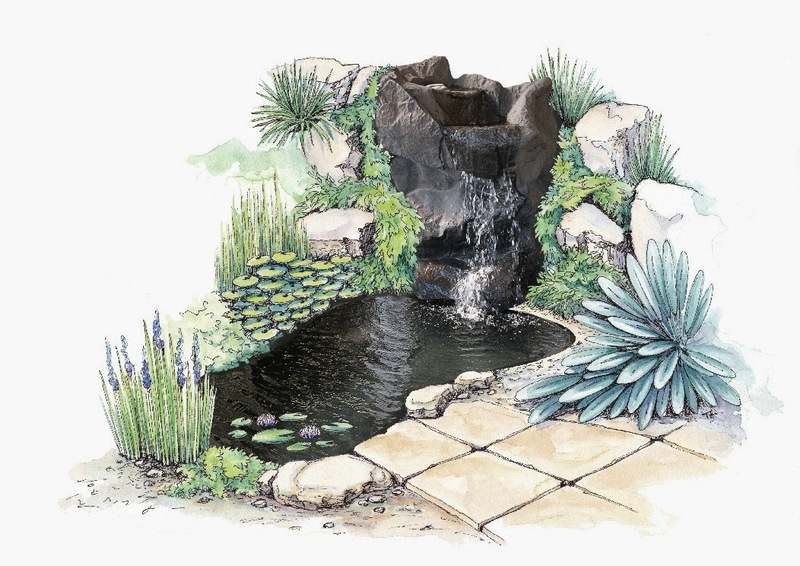 One of the many things I've been working on of late are a series of illustrations, for a landscaping company, Cempro, to promote their man-made water features on-line. My name was put forward for the job, with others', and I took the opportunity to "run" with it as I am looking to do more illustration work and to stretch my creative wings with new projects. Although I had never done any work of the sort before that combines the use of illustration with photographic images I figured that I had enough skills to set me on my way and I have since honed these skills through the process of doing. 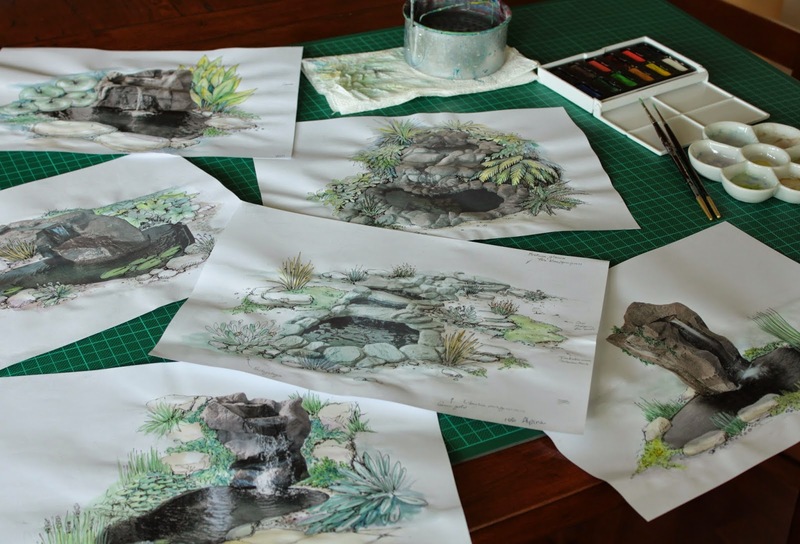 The task of illustrating gardens harps back to a previous life when I worked for a design company and I would do landscape impressions for people looking to enhance and develop their properties. Something I didn't take into account in quoting for the job was how long it would take to come up with a suitable planting scheme to suit each water feature and style of garden as I wanted the plants to mostly be real and identifiable, not just random indistinguishable greenery. As it turns out it has been a bonus for the client to have identifiable selections of plants - he is confident that it will help to sell his products as it will help people to know how to plant them up. Before I set my brushes to work, his photographer, Shelley Lewis, had to photograph each of the features with water running through them. She then prepared the files for me as a silhouetted image on a transparent background. I then used her images to work up a rough in pen and wash which I would submit for approval. I would then go on to create the final image on heavy watercolour paper, starting with the watercolour and finishing with the line work using a pigmented liner. The last step was to merge the two images on Photoshop. This is still work in progress as I await the next batch of products to work on. It will be some time yet before the images are on-line, presumably on a newly designed website. 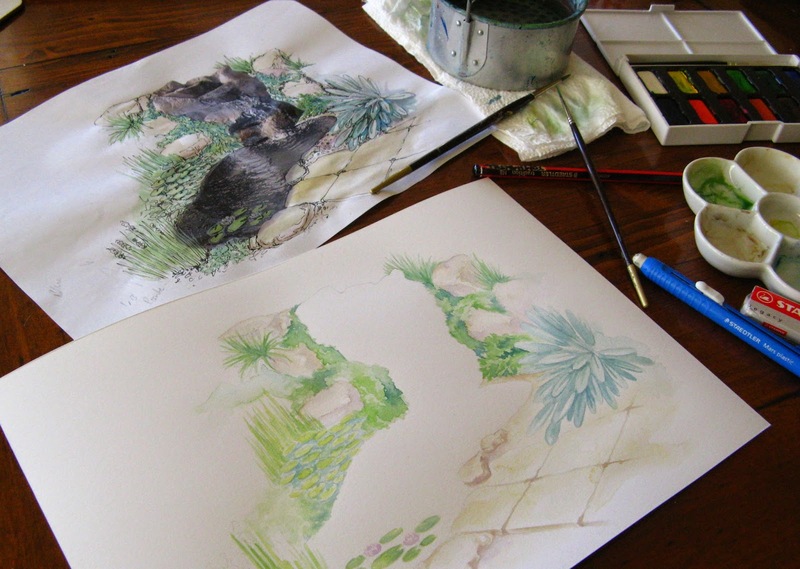 Although challenging on several levels, it has also been a thoroughly enjoyable experience, especially getting me working in watercolours again, which I haven't used for a very long time. And, having the excuse to pour over gardening books and to peer into people's gardens to look for inspiration. I also find that I am looking at plants in a totally new light again - as in how I would draw them and render them in watercolour.